Universal tool for pushing out bonded (micro­en­capsulated) or heavily corroded drive shafts. Damage to the drive shaft ­thread is prevented. Suitable for almost all 4- and 5-hole wheel hubs with a pitch circle diameter up to 136 mm. 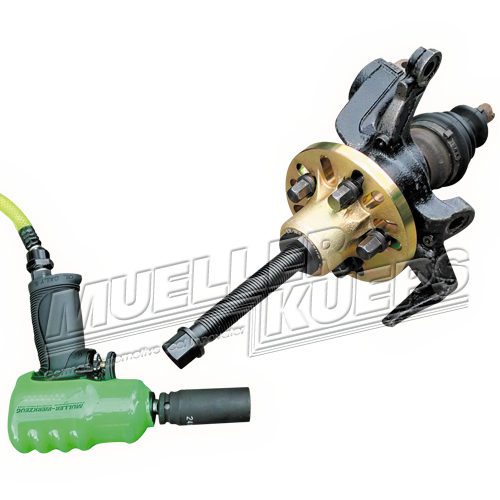 The “VIBRO-IMPACT” principle: the vibration impact of the ­pneumatic wrench is transmitted to the wheel hub and to the drive shaft through the trapezoidal thread spindle. When used in conjunction with the slide hammer 433 450, the drop-forged flange can also be used for extracting wheel hubs.